Doctor Sudhir D'souza PhD,FRCPC Thank you for Believing in me. 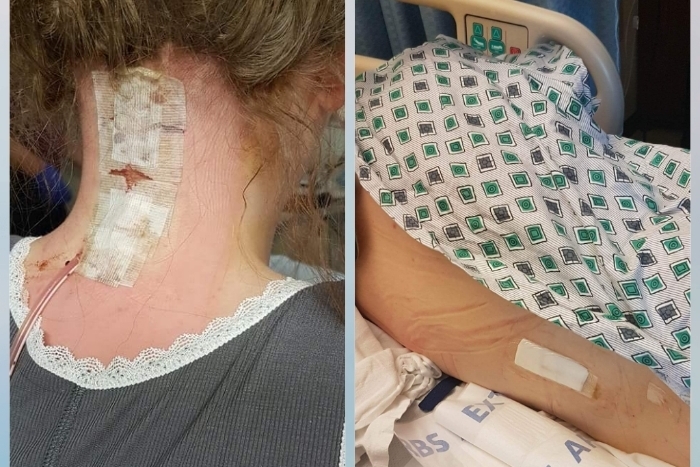 This is a plea for financial support for a lifesaving surgery needed by my patient Caroline Smith. Caroline is a remarkable 16 year-old girl afflicted by a terrible disease called Ehlers-Danlos Syndrome (EDS). I have been her physician for 15 months. 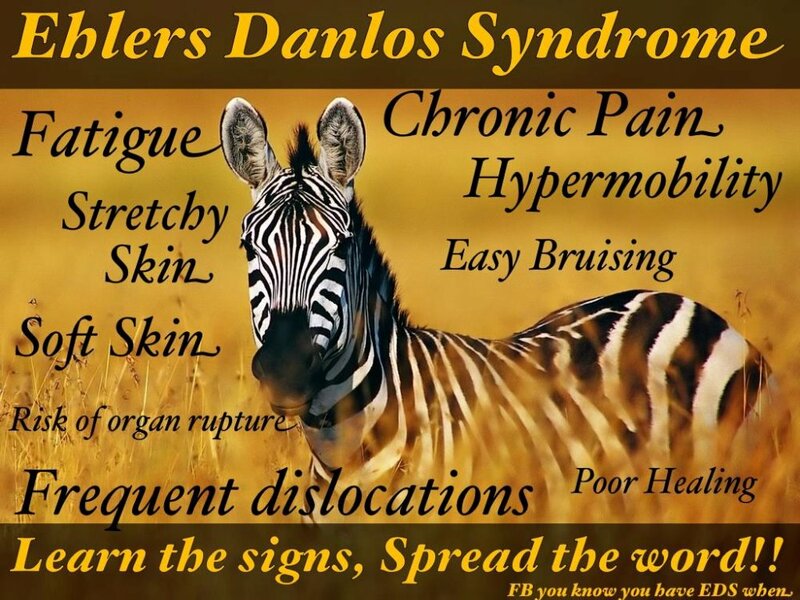 EDS is a group of inherited disorders, where a protein called collagen, which is one of the main components of connective tissue, is defective. Connective tissue provides the underlying foundation for all the structures in your body, skin, muscle, ligaments and blood vessels and organs. Patients with EDS show a range of problems. The defect in collagen results in a loose connective tissue, which leads to amongst other things frequent dislocation of the joints, triggered by little movement or trauma. Patients with EDS constantly experience pain from increased stress of the muscles and ligaments. A serious complication of these long-standing types of pain is chronic pain, which is often misdiagnosed and misunderstood. Caroline lives with pain every day. She does not like to take medication and tries hard to live through it. 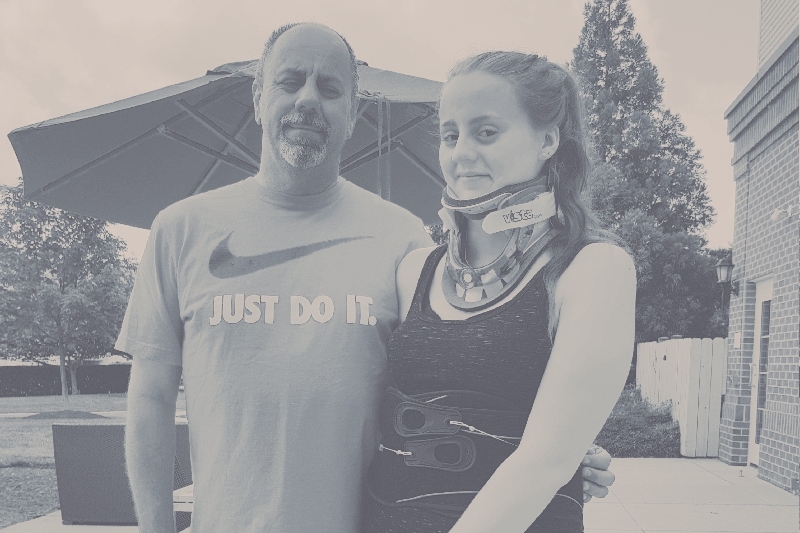 Even her resolve and her strength cannot overcome the lack of connective tissue strength that affects her spine. She needs two major surgeries immediately. One is to fuse bones very close to where her head sits, directly on her spine. The other is to help her lower spine and to release an associated tethered cord syndrome – a stretching of the spinal cord. Clinically, the diagnosis is readily made and the problem can be addressed by surgery. I have tried my best to get her the attention she needs in Ontario and in Canada. Sadly, patients with connective tissue disorders are rare, but they are also not ‘ideal’ patients for surgery. So, when the diagnosis is made, surgeons most of whom have little experience in the area, are reluctant to act. Over the past 5 years, this athletic well-adjusted young woman has been labelled and dismissed. 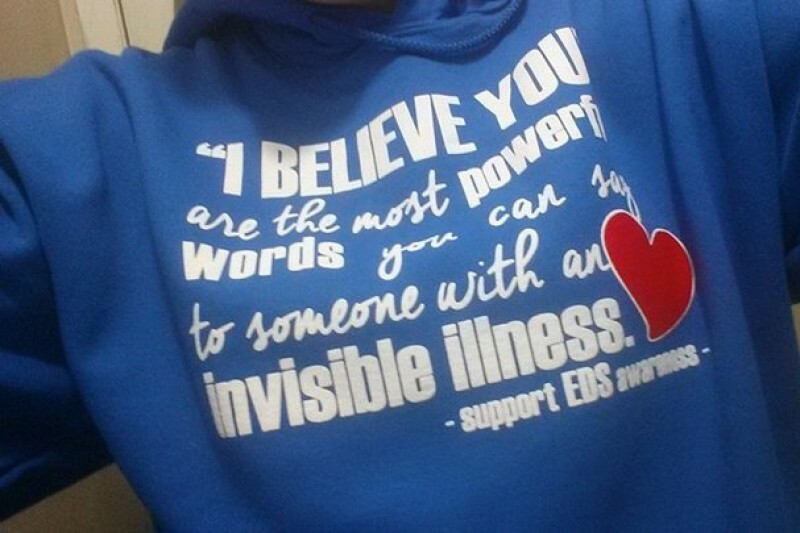 She was only diagnosed with EDS 1 year ago. 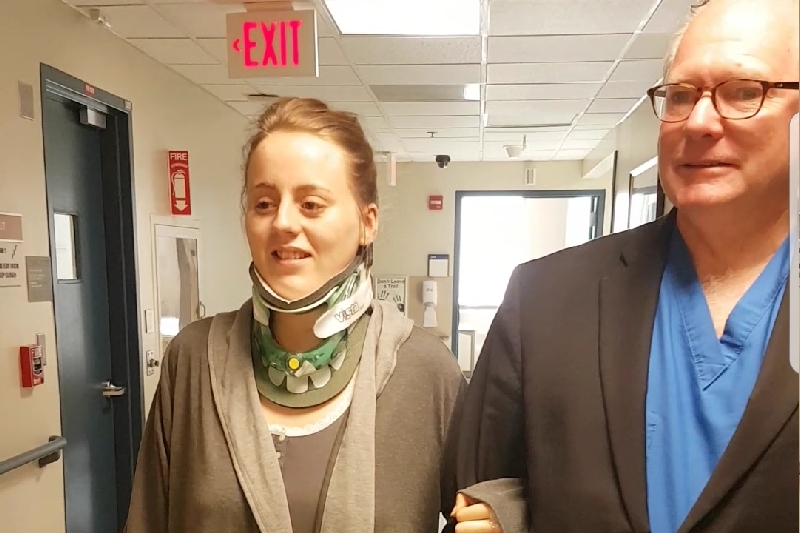 She lives in constant pain, and her tethered cord symptoms were dismissed by 2 exceptional neurosurgeons. Desperate, her father gathered his limited personal funds and had her seen by the world expert in this area, Dr. Fraser Henderson in Baltimore, who agreed to open up his closed wait list and see her after I called him. Dr.Henderson has recommended the two surgeries. The first could be performed by any neurosurgeon in Canada. However, to get one to look at this young woman has been difficult. The second requires the fine hands and expertise of Dr. Henderson. The government has rejected my request to fund these surgeries. Caroline, her family and I have made the very difficult decision to ‘go public’ to raise funds to have the surgeries done in Baltimore. I can assure you that Caroline needs the surgeries. Please consider donating from your precious resources to help a very worthy young woman? If there were another way, I would not have put my patient, her family or myself in the public domain. Hello everyone! I have been meaning to update but have been feeling pretty rough these last few days. We were cleared to travel home on Friday but I've been so uncomfortable that we now our finally on the last stretch til home! Dr Henderson was very happy with my progress and how well I had came back from the 2 surgeries. We found I'm actually the youngest and second ever patient of his to under go two spinal surgeries in one day! Although I'm still quite sore and struggling doing day to day task on my own, (even putting shoes on seems like a mini marathon) I have realised so many positive changes in my body. The sensation in my legs has improved to the point that I now know where my mystery bruises we're coming from, my self! I now feel every little bump which makes it easier for me to prevent them now. My head aches and migranes have subsided and I so far have only had one head ache since surgery after a long day of traveling and alot of moving around. I'm still using my walker for getting around while my body gets used to it's adjustments and for some extra stability. Today I will be arriving at home and I'm beyond excited to see everyone I've only been able to see thrpugh video calls for these 2 weeks I've been away. I want to thank my dad and Joanne for being here through this up hill battle with my EDS as well as some other very important people. Lisa and Antal Szabo, Cathy Steffaneli and the woodveiw crew, my boyfriend, all my friends and my Grandparents who have been able to keep my spirits up when I've just wanted to be down from pain and frustration. You guys are all amazing people who have gone above and beyond to support me these last few years, especially this last month. A huge thank you to all my other supporters who have continued to share my story and have donated towards the costs that accompanied this scary but miraculous surgery that has given me so much or my life back. You guys are all amazing!! Also, Happy late father's day to my awesome bestfriend of 18 years, my strength when I'm weak and my inspiration, My Dad! So we are almost at a week post op and slowly but surely I'm starting to feel better. Immediately I could feel the difference in my legs. They usually were pretty numb, feelingless and had poor colour. Now, they are improving in muscle tone and have keep full feeling! The awful tremors and shakes I suffered from daily have slowed down also. But one of the biggest things, no more dizziness and accidents!! Although I'm still quite sore and the process is going to be long. I'm ready to continue my fight. (Picture's below are of my neck and back incisions). Thank you so much to all my awesome "fans" for their donations, kind words and sharing my long but worth every step journey! First walk and IT'S DISCHARGE DAY! 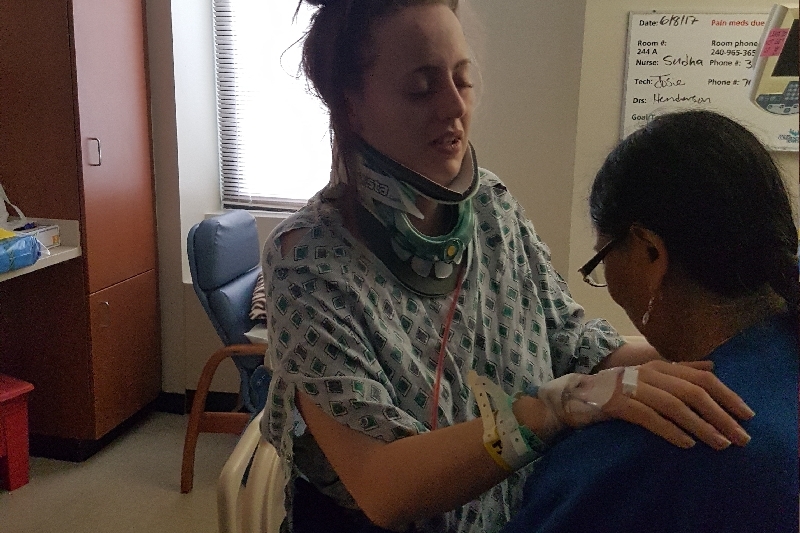 Carolines first time up after surgery. Oh I just had another idea - the Hamilton Tiger Cats donate all the time to charities. I am going to contact them on your behalf to see if I can request a donation for you, or if your parents need to do it. The guy in the picture here with me is from Brantford and plays for the Tiger Cats!! I'll let you know what I hear!! Can someone please contact me or who would i contact about helping raise more funds towards this cause ? Hi Caroline, I hope you are on the mend from breaking your wrist! When you mentioned Evan in your last update it made me think that perhaps in the Brantford and/or Paris upcoming Christmas parades you could ask permission to have people walking the route with donation buckets collecting on your behalf. I don't know if it is doable, but may be something to look into. Take care sweetie! 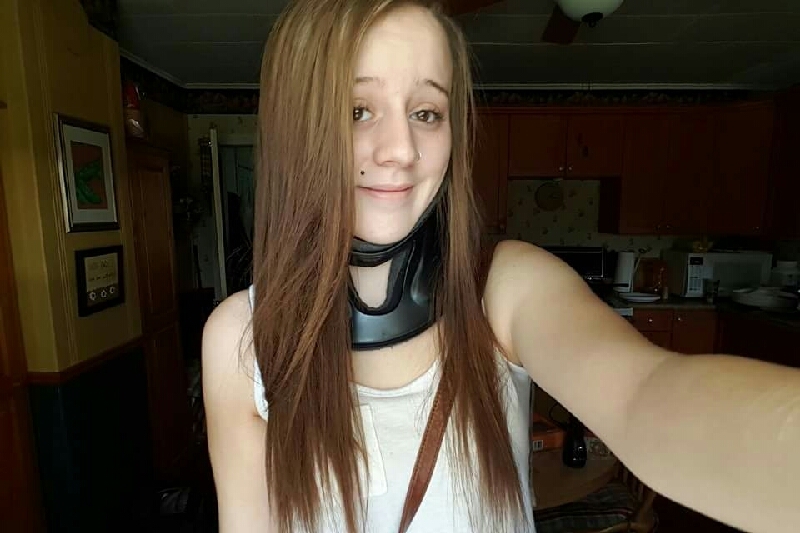 Caroline - my name is Barbara and I live in Concord NH and also have EDS. My best friend Heather Franklin lives in Burford and is collecting bottles for you. She goes out once a week and picks them up from along the side of the road. Heather sent me your information. I hope that your surgery in Baltimore went well. One of the things that has really helped me is the Muldowney protocol - you need to progress through this with a physical therapist familiar with the program. All the best Caroline!